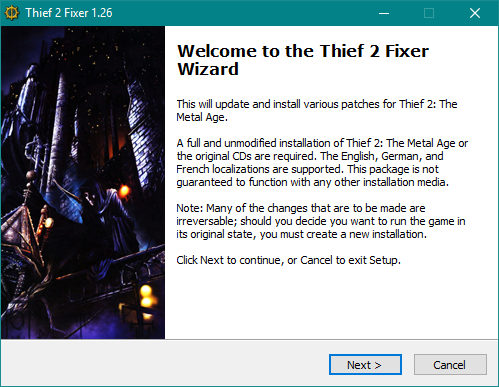 T2Fix is a complete and self-contained patcher and installation utility for Thief II: The Metal Age. Currently, all official patches and several fan-made patches and mods are incorporated, making installing and managing the game as simple as possible. 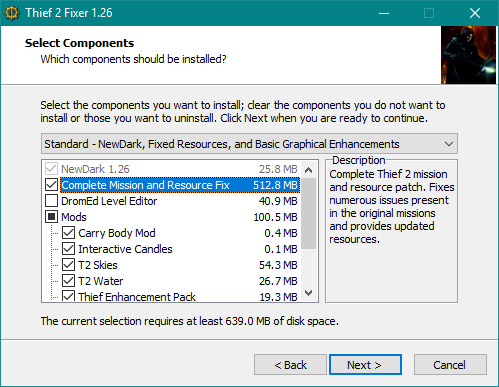 It includes NewDark, the latest fan-developed update to the Dark Engine, providing substantially better support for modern operating systems and video hardware, along with fixed original missions, providing the most pleasant and smooth experience that Thief 2 has to offer. Ensure the game is not running prior to using T2Fix. It will be necessary to restart the current mission, as saves will be incompatible. T2Fix Lite - Intended for those with limited storage, poor bandwidth, or those who have absolutely no interest in any sort of mods or enhancements. It is, however, still highly recommended to use the full version if at all possible. -Ensure both the Visual C++ 2008 SP1 Redistributable and the DirectX End-User Runtimes are installed prior to running setup. Most systems should already have these installed, but in the case that they are not, they are available below. -Do not have Thief 2 located in a protected folder such as Program Files and do not set any compatibility modes on the main executable. Doing either will result in a variety of strange things happening, such as an inability to save or load the required resources. -The officially supported game languages are English, German, and French. While other localizations will likely work without issue, they are not explicitly supported. -Windows 2000 or higher must be installed for T2Fix (and NewDark) to function. -NewDark requires a Direct3D9-capable graphics card to fully utilize its capabilities. Most graphics chipsets made in the last decade should suffice, but if for some reason you are using a graphics card without these capabilities, running the game with the "-use_d3d_display" command line argument will start the game with the legacy renderer. All components except those marked are optional. After selecting the installation directory, T2Fix will prompt the user to select an installation type. Each type pre-selects a series of components based on user preference, after which the user is free to further enable or disable components as he sees fit. Essentially, each "Installation Type" acts as a preset of sorts. -Setup will automatically detect your monitor's resolution and set Thief 2's default resolution accordingly. -Basic settings such as Sky Detail, Fogging, and resolution can be changed in the game's settings menu. --High: Anti-aliasing, HDR Rendering, Bloom, Windowed Mode, and increased FOV are enabled. Select this if you have a reasonably powerful dedicated graphics card. --Default: Anti-aliasing is enabled. Select this if you have a dedicated graphics card or are unsure what else to select, as this is the default option. --Low: No special features are enabled by default, but it yields the best performance. Select this if you have a very weak system or integrated graphics. *All advanced graphics settings can be viewed and changed at any time by opening "cam_ext.cfg" in the installation folder with any text editor. -To change DromEd's display resolution, edit "USER.CFG" in the Thief 2 installation directory and uncomment the desired resolution while placing a semicolon in front of the resolution that was selected prior to your change. *The game installation function is only compatible with the original, first-party CD releases of Thief 2. If you own another version such as the one distributed by Mastertronic, install the game using its own installation utility prior to running T2Fix. 1) On the installation directory page, select the folder in which you intend to install the game and check the box that reads "Install Thief 2 in the above directory from original install media". 2) Click "Next" and choose the location of your first Thief 2 CD or the location of its copy on your local drive. If the disc is not inserted, ensure it is in your drive before selecting its location. 3) Continue with the installation as normal. 4) If you are using the two-CD version, setup will prompt you to select the second CD during installation. Insert the second CD, removing the first one if necessary, and click "OK". Failure to select at this stage in setup will result in installation aborting. -To install NecroAge, simply place the downloaded NecroAge.crf into your Thief 2 installation folder. It will be activated automatically. Delete this file to uninstall. -To install EP2, simply place the downloaded EP2.crf into your Thief 2 installation folder. Delete this file to uninstall. -To reinstall a component, simply run T2Fix again with the same components selected. Each selected component will be installed over the existing component. -To uninstall a component, run T2Fix with any previously-installed component unselected. T2Fix will uninstall any component that is both installed and unselected on the components page. --FMSel: a simple yet effective loader that is included in T2Fix. --AngelLoader: a fast, full-featured, standalone FM loader that is compatible with all three Thief games. --NewDarkLoader: a loader that aims to include the utility of FMSel while also offering a friendlier interface. -To start FMSel, either use the shortcut provided or launch Thief 2 with the "-fm" command line argument. Removing the semicolon preceding "fm" in cam_mod.ini will cause FMSel to always start. -It is not recommended to use Darkloader, as it is rather outdated and is known cause issues with NewDark on occasion. While there is currently no professional method to report issues, leaving a post here should be effective. All discussion, help, and suggestions should be kept here to receive satisfactory responses and to avoid cluttering other areas. If you are experiencing an issue that requires investigation, a screenshot and a save would be most helpful in diagnosing and fixing the problem, along with a proper description. Issues pertaining to any of the included components are welcome here. All credit, of course, goes to the creators of the included components, without which this would not exist. I will gladly oblige any requests made by the component authors. Awesome work! I really appreciate these patchers, they make things so much nicer and easier even for a DIY tech nerd such as myself. Thank you! I've reinstalled both the game and DromEd with the new patch and noticed that Thief 1 textures no longer have the texture palette applied to them. Here in Disorientation, you can clearly see how much more saturated the object roof is against the brush roof even though the latter should also be bright red. After a short investigation, I found out that in cam_ext.cfg, "disable_32bit_fampal" is uncommented. I'd recommend leaving it commented by default. With it, the colors are back to normal. Last edited by marbleman; 24th Mar 2019 at 08:11. *checks stuff* yeah, this looks like something that should only be uncommented if things don't work properly. careful with variables that aren't part of the default cam_ext - it's for a reason, probably. Since it does indeed cause an issue when enabled, it should probably be commented out by default, though still included in the case that a user needs to enable it. Should a fan mission require it, such settings can be set per-mission. However, this should be safe to enable by default as it improves the smoothness of the game without any noticeable consequences. EDIT: This change has been reflected in T2Fix, which now has the family palette enabled by default. Since this is a very minor change and the previous version was available for less than twelve hours, I saw no reason to bump the version. Thank you! Though the work I did compared to the work the authors of these fixes is miniscule, it will be nice to have an up-to-date patcher available for everyone in the future. If the user does have T2 installed in Program Files, why not offer to move it for them? I have my Thief2 as a portable game and had to reinstall the GOG version for this patch (unlike TFix and Tafferpatcher). I installed the candles mod. Deleting or renaming its folder should suffice to disable it or is there anything hardcoded in the original missions after selecting the mod to be installed? In Running Interference you can mantle and jump over the gate at the start of the mission. Is that normal? I have this sky folder which is much shorter than the one in the package. Gecko´s perhaps? - I've tested GOG, steam and Platinum DVD (the 1.07/1.18 hybrid), all were patched up properly. - renaming the CANDLES folder will disable the mod, however you need to restart the current level to unload everything completely. - yeah, the patcher currently doesn't make any objects unmantleable, so you will be able to mantle to places where you couldn't go in oldDark. I suppose that would be a welcome feature. I will look into implementing this in a future version. T2Fix checks for the following files to ensure everything will work properly: Thief2.exe, DARK.GAM, gen.osm, the mission files, movies in .\MOVIES, and resource CRFs in .\RES. If T2Fix did not recognize your installation, it was because one of these was not present. Tafferpatcher does not implement such checks, which is likely why you noticed this. I suppose these checks could be removed, but their purpose is simply to ensure everything is in order prior to patching up. 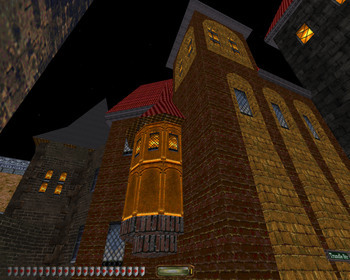 Additionally, all of these files are vital to the proper functionality of Thief 2, so their absence or dislocation has a high likelihood of causing issues. T2Fix can both install and uninstall all optional components, but yes, deleting or renaming any of the mod folders will effectively prevent them from loading. The only changes to the missions are installed with the fixed missions pack, which is optional and not dependent on the candles mod. Yes, with new mantle, it is possible to mantle over that gate in the first mission. This was discussed in-depth prior to release and it was decided that it would be left alone, at least for now. As for the skies, currently implemented is jermi's t2skies as it was released. 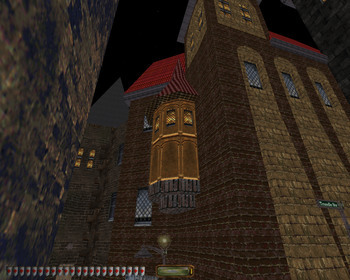 It does indeed look like what is in that archive is the version included in the HD Mod. Feel free to use it, but the version included in T2Fix will likely remain the same. This should definitely be a sticky thread. Edit: Is the English subtitles patch included? Last edited by Arcatera; 24th Mar 2019 at 16:29. TFix actually does check for all the crf files (and will complain if some are found to be missing). and yeah, T2 skies should be fine using the original Jermi's resources/copy pasting the pack from TafferPatcher. if it ain't broke..
Ah, I was unaware of that. I have updated my previous post accordingly. Generally, I think such checks serve only to benefit user experience while using a tool such as this. In the relatively rare case that an installation is not recognized, all can be fixed by a simple reinstall if all else fails. Yes, it is. For some reason, I neglected to mention it in the first post. It is now corrected. I see it in the main folder. What if I remove it from the game? The schema folder is for those using DromEd. Fixed schemas are included with the fixed resources and the original schemas are included with DromEd. If you do not intend to use the mission editor, removing the schema folder will have no adverse effects on your gameplay experience. Thread stickied and Tafferpatcher thread unstickied. as people will still be landing in the TP topic for quite a while because of old links, it'd perhaps be prudent to add a big red note to the top of the first TP post letting everyone know that it's no longer maintained and one should go get T2Fix. also, dropped a note at the GOG, steam and rpgcodex forums. Last edited by voodoo47; 25th Mar 2019 at 07:57. I have just installed T2Fix and noticed there is no EnableLAA.exe in my new T2 folder, along with a number of other files such as EditMode.cmd, EditModeAtPlr.cmd. I'm not sure what a lot of these files do but EnableLAA.exe is really useful, if not essential for some of the bigger missions that come out today if you want to open them in Dromed. Is there any reason not to just include the LAA patched version and not the unpatched? This is the LAA patched version, not just enableLAA. are the LAA patched executables compatible with 32bit systems? if they aren't, they shouldn't be the default. Good point voodoo, they may not be. Does anyone have a 32bit system to check it on? LAA is also for 32 bit Windows. well yes, but they are not talking about ND, are they. will check 32bit win7 tomorrow unless someone else tries in the meantime. anyway, one more small thing that may be of use - I've put together a small T2 ND package awhile ago (naming it T2Fix, funnily enough) for a steam user that couldn't use TP for some reason (either dial-up or antivirus). it's been designed to hammer the steam build (the trainwreck it is) into a workable state (ND, alpha fixes, cam_ext tweaks, proper 1.18 patch files) - feel free to link/not link it with/without changes in the first post for whoever is unable to get/use the full package for whatever reason.